all have traditions going back up to several thousands of years and had a common link for well over 2000 years via the Silk Road. Red Lines indicate Land Routes; Blue lines indicate Sea Routes. The Silk Road is at the Heart of Traditional Medicine. As a direct trade route it has been in use for well over 2000 years. 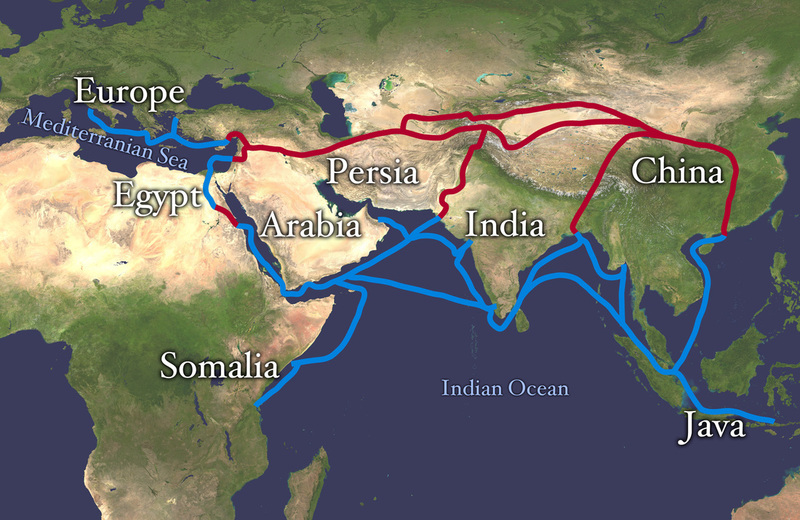 Indirectly, this route has existed far longer (with commodities and information being shared between neighboring cultures). The Ancient Egyptians used spices from the East, for example. Although its name is derived from the Chinese Silk traders which used the route from the Han Dynasty (206 BCE – 220 CE), the cross pollination of ideas and the passage of knowledge was arguably far more important. It is obvious that theory and technology was passed along this route from a very early age. Around 2000 years ago, water trade routes began to be used from Hanoi to India, and from the Red Sea to the west coast of India. Many medicines, including Musk, Rhubarb and the Spices, were imported into Europe from China, Tibet and India. The herbal of Dioscorides, for example, already contains numerous Eastern medicines and Hippocrates (2400 years ago) likewise used medicines such as Cardamon, Cinnamon and Cloves. Even the Ancient Egyptians had access to Cinnamon, Cloves and various other Eastern medicines. This shows the flow of interaction of the various medical systems for nearly 3000 years. As stated before, the ancient Greeks and Romans were already familiar with numerous medicines from the East. Likewise, Tibetan Medicine uses medicines such as Lapis Lazuli and Red Coral, the use of which was imported by the Arabs over 1000 years ago. The Chinese have also long used medicines introduced from the West including Myrrh, Frankincense, Dragon's Blood. Perhaps the most interesting 2 medicine systems are the Unani and Tibetan systems. These intermediate systems had a wider scope of influence due to their geographical location. Arab physicians were strongly influenced by the ancient Greeks from around 900CE, but were equally influenced by Indian Medicine systems, as well as the ancient Persian Tradition. Tibetan Medicine was well established before Buddhism arrived being closely allied with its traditional Bon religion. It was largely influenced by Indian Medicine which was introduced when Buddhism arrived. But before this Tibetan medicine had already been greatly influenced by other systems when in 685AD the King of Tibet invited medical scholars from Persia, Indian, China, Bhutan and elsewhere to share their knowledge. Around this time, Middle Eastern Physicians were employed as Court Physicians, and from this the influence of Arab physicians began. So Tibetan Medicine doctrine is now very closely based on Ayurveda, while the practice and formulas were influenced by Unani medicine. Even the use of Gem stones in Tibetan Medicine were probably introduced by the Arab physicians. The Western Tradition is commonly said to have originated with the Greeks. This is wrong. What the Greeks did, and Hippocrates in particular was to apply rationalism to an already ancient tradition. The Greeks obtained much of their knowledge of the Arts and Sciences from the Egyptians. This is clear when we look at the Greek God Hermes. He was identified as the Greek version of the Egyptian God Thoth, who was the Moon God, God of Wisdom and Knowledge, and the originator of the Arts of Medicine and Alchemy. The Western Alchemical Tradition, allied to the Ancient Medical Tradition, is known as the Hermetic Arts with at least part of this knowledge originating with the Ancient Egyptians. The Western Tradition, via the Greeks, can then be seen to originate in Ancient Egypt, and also probably having at least some of its roots in Mesopotamia and the ancient civilisations of Babylon and Assyria. The Western Tradition is vast in its scope, both in time, area, and civilisations which contributed to it. It has direct influence from Egyptian, Greek, Roman, European, Arab and Indian sources. 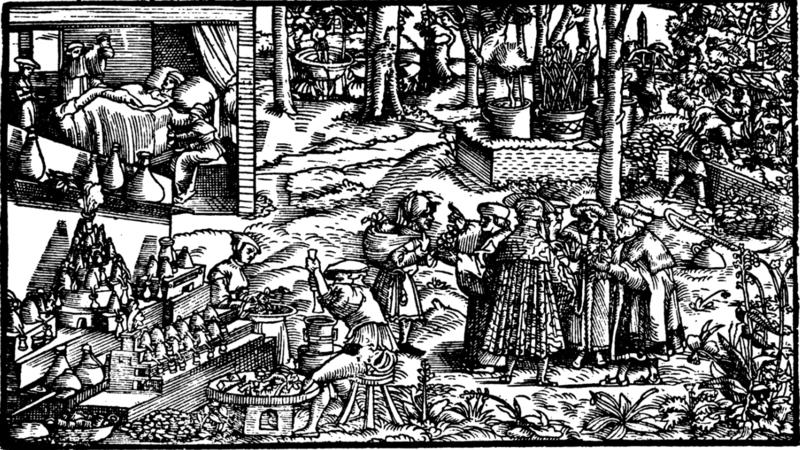 In addition, as the Europeans began to colonise remote lands, they brought back medicines with them that greatly increased the Materia Medica at their disposal. The Eastern Traditions are based on ancient texts going back over 2000 years. In particular, the Vedic texts (the books of Sacred Knowledge) of India are said to have been revealed to seers of the Aryans in the second millennia BC and passed on by oral tradition. Modern scholars differ greatly on the exact age of the Vedic texts but they are definitely of ancient origin. There is also speculation that the early Chinese were heavily influenced by Egyptian and Mesopotamian travelers. Albert Terrien de Lacouperie, a French Philologist published the Western Origin of the Early Chinese Civilization from 2300 B.C. to 200 A.D. in 1892. In it, he noted the hexagrams of the I Ching (Book of Changes) to be very similar to Mesopotamian Cuneiform text. He also found evidence supporting early Chinese language to be influenced from Akkadian and Susian languages. Further, he equated the Yellow Emperor (Huang Di) with the Mesopotamian King Nakhunte who is said to have brought his people to the Yellow River Valley approximately 2300 BCE. He proposed the Chinese ‘Huang Di’ was derived from hun-te. Thus, the Yellow Emperor was possibly in fact Nakhunte (Nak-hun-ti). The Mesopotamians were the first in many areas, including having a written language and an advanced medical system involving accurate diagnosis with appropriate treatment. Thus it is highly possible early Chinese Medicine was influenced by the oldest medical system on the planet. Buddhism also had a major role to play in the spread of medical knowledge throughout the East. As Buddhism was introduced to Tibet, Nepal, Mongolia, China, Japan and elsewhere, so medical knowledge was also shared. The basic doctrine of Tibetan Medicine can be seen to be very close to Ayurveda of India and this also followed through to Nepal and Mongolia amongst other places. Likewise when Buddhism arrived in Japan from China, a great deal of the medical knowledge of China followed with it. So much so that the Medical Tradition of Japan relies heavily on Chinese Philosophy, Materia Medica and Formulas. Thus, the purpose of this website (Integration of the various medical traditions) has already been in progress for thousands of years, with all medicine traditions devouring and incorporating Theory, Materia Medica, and treatment from other systems at any opportunity. Now it is time for western practitioners of Traditional Medicine to follow this lead and move forward, blending ancient knowledge and reforming it into a practical model for modern use. It is for this purpose that medicinetraditions has been created.